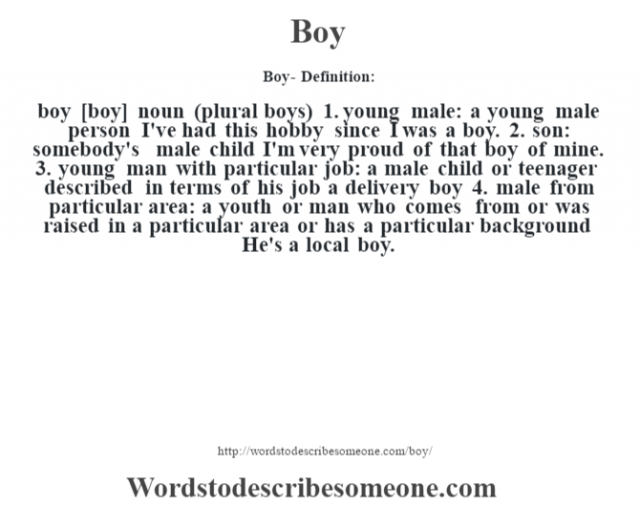 boy [boy] noun (plural boys) 1. young male: a young male person I’ve had this hobby since I was a boy. 2. son: somebody’s male child I’m very proud of that boy of mine. 3. young man with particular job: a male child or teenager described in terms of his job a delivery boy 4. male from particular area: a youth or man who comes from or was raised in a particular area or has a particular background He’s a local boy.